Left to right: Meredith Hagedorn, Doll Picotto, and Maria Giere Marquis. Photo courtesy Kimberlee Wittlieb and Dragon Productions. Dragon Productions, located in downtown Redwood City, is notable for performing strange and obscure plays that test the boundaries of the medium of theatre. Their current production, Eric Overmyer’s On The Verge (Or the Geography of Yearning) falls firmly within their wheelhouse. 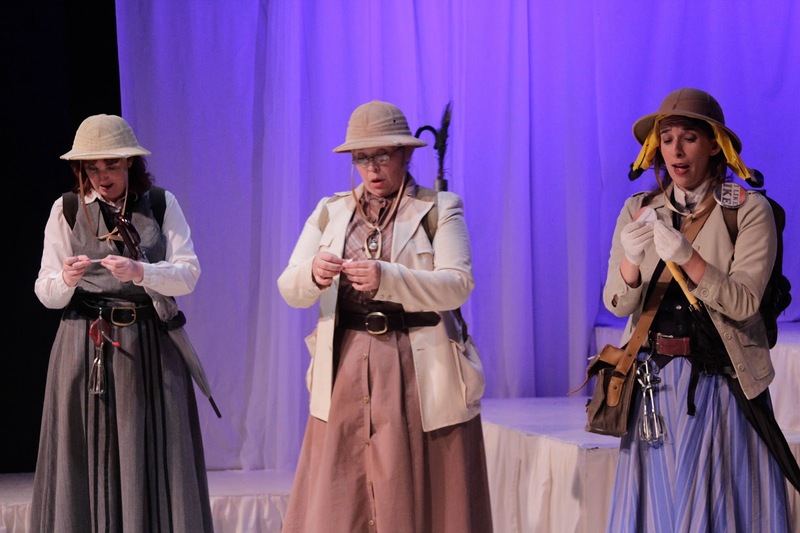 Using the trappings of three Victorian-era explorers on an adventure in the mysterious Terra Incognita, the play embarks on a wild journey through time, language and culture that defies literary norms. Though there is technically a plot, much of it is an excuse, the colorful tent pitched over a linguistic funhouse. There’s no sense of dramatic structure or stakes, and very little character development, but the show doesn’t need it – it’s a whirlwind of words, an exploration of sound as much as meaning through the use of rhymes, description, and onomatopoeia. It’s much closer to poetry than it is to literature; if you go in expecting this experience, you’ll get more out of the show. Despite the looseness of the plot, the three main characters are well defined. Mary (Doll Picotto) represents the values of her native Victorian era, professing the virtues of stiff bloomers and classical anthropology. Her booming voice and intense personality win the audience over. On the other side of the spectrum is Alex (Maria Giere Marquis), a younger explorer obsessed with rhymes and Tibet; she’s more than willing to eschew her social norms and gaily dance forward into the future. Bridging the two is Fanny (Meredith Hagedorn, also the executive artistic director of the company), who doesn’t subscribe to any one corner of acting but adapts as the circumstances change. The ever-surprising Tom Gough pops up periodically in a number of different roles, ranging from a small yeti to the mysterious Mr. Coffee. The set is more suggested than built, a stark black-and-white affair that makes use of projected subtitles to separate scenes. Lighting designer William Campbell subtly relights the stage to give a vague sense of location: a pale green for the misty rainforest, icy blue for the freezing mountains. Following the example of the play itself, the technical details of On the Verge are blurry and ambiguous, designed deliberately for the audience to not have a clear mental image of what’s happening. A lot more occurs in On the Verge than I describe in this review, and I’m purposely leaving it out so, should you attend, you can experience the same surprises as the opening night audience. It’s a tremendously strange play, a slice of the unexpected unlike anything you’ve seen in a long time. If you’re a fan of plays that are a little more out there, consider it for your next evening of theatre.